Although one may prefer treatment for peace of mind, any treatment option has some associated risk. In some cases, more aggressive treatment might not be the best choice. The factors that favor treatment (e.g. risk of rupture) should be weighed against those that favor non-treatment (e.g. risks inherent in the procedure). A major international study suggests that rupture rates of some small unruptured aneurysms without symptoms are quite low and do not justify the risks of treatment (The International Study of Unruptured Intracranial Aneurysms Investigators, 1998 cited in Johnston et al., 2000). For these cases, the choice might be a surveillance program as opposed to immediate intervention. This would involve annual check-ups to monitor blood pressure, cholesterol and other medical indicators. Doing regular scans or imaging examinations to ensure the aneurysm has not substantially grown or changed would also be indicated. These two medical experts have different training and backgrounds; it is highly recommended to speak to both before proceeding with a treatment plan. Additionally, one can consult with a neurologist, a brain specialist, who does not perform operations but can advise you on treatment options. The term endovascular (within the vasculature or blood circulation system) refers to the coiling as a less invasive procedure, i.e. you access the aneurysm through the natural body channels, the arteries, rather than opening the head by surgically going through skin, bone and other tissue. A ruptured aneurysm (patient has already experienced a subarachnoid hemorrhage, SAH), generally requires treatment as soon as possible due to the high re-bleeding rate. Treatment options of the SAH patient are the same procedures (coiling and clipping) as for unruptured aneurysm, however, the decision is made by the attending physician as the patient is often unconscious or unable to participate in the decision-making. Treatment time and option decisions are made based on similar criteria: size, location and shape of the aneurysm and the added factors of the hemorrhage as well as the patient’s overall medical condition. 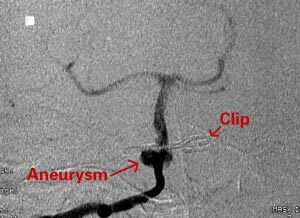 One caution the family of a ruptured aneurysm patient might want to take at this juncture is to ensure that both an interventional radiologist and a neurosurgeon consult over the case as time and the patient’s condition permit. In some cases either technique could be used, and the recommendation on how to proceed will be influenced by a number of considerations including, the age and condition of the patient and the experience and skills of the attending physicians. Surgical clipping, a microsurgery, is performed by a team of doctors and led by a neurosurgeon. It is an "open surgery" involving the cutting of the skull, separating the two lobes of the brain and attempting, with a minimum of brain handling, to get at the aneurysm. The operation is done under general anesthesia. Neurosurgeons tend to rule out patients for this procedure based on the location of the aneurysm (Johnston, et al. Endovascular and surgical treatment of unruptured cerebral aneurysms: comparison of risks. Ann Neurol. 2000 Jul;48(1):11-9), the most problematic being the cavernous carotid. Barring complications, the hospital stay is usually 4-6 days, with post-operation recovery 3-6 weeks (American Stroke Association; 2003). 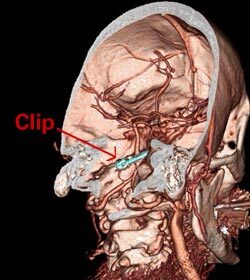 3-D Volumetric CT scan of cranium with a clip represented in blue. After making a usually straight or zigzag incision at the back of the head or near the hairline, depending on the location of the aneurysm, the neurosurgeon will remove a small section of bone from the skull. With the aid of a microscope the neurosurgeon will navigate past the exterior of the brain tissue without cutting into it in order to gain access to the arteries and the aneurysm. A tiny metal spring clip is then placed permanently across the neck of the aneurysm sealing it off from the normal blood circulation in the artery. 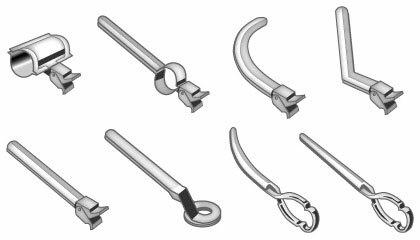 There are several types of clips which may be used. The section of bone is then replaced and secured and the incision is closed. If there are complications from surgery or a hemorrhage event, the hospital stay could be 1-4 weeks or more. If treatment is undertaken following a rupture, it is likely that it will be done within a short time of your arrival in the hospital emergency room. It is important to have as thorough a discussion of treatment options with your doctor as your situation permits. If more time is available, as in the case where the aneurysm is discovered prior to rupture, you will have the opportunity to question the neurosurgeon more closely about the risks and benefits of the treatment and what to expect during and after treatment. Important questions may include: the frequency and success rate of the doctor and the hospital performing the procedure, location and type of incision and stitches, possibility and arrangement of blood transfusion from personal or family donation or from the blood bank, potential complications, recovery time in the hospital and at home, and the advisability of screening close family members for aneurysms. Assuming an unruptured aneurysm, you will first attend a pre-operative appointment scheduled, usually the day before your surgery, wherein you will undergo testing (blood tests, EKG, chest X-ray, etc.). The doctor will explain the procedure, risks, and ask you to sign release forms. You should come prepared to discuss your medical history including any medications you are currently taking. Make sure you are aware of the guidelines for your hospital with respect to not eating before general anesthesia. Also in the pre-operative appointment, an anesthesiologist will discuss the use of anesthesia during the procedure. General anesthesia is typically used in this procedure for patient comfort, to keep the head immobile and to assure the quality of the X-ray image. Let the doctor know ahead of time if you have a problem recovering from anesthesia. There are medications that can assist in your recovery. On the day of surgery, the course of action should have been completely explained to you. One of the first steps will be to shave a section of the head. This may or may not be done before you are sedated. Urine production will have to be monitored and a catheter will be inserted for this purpose. An IV or intravenous line will be inserted to monitor blood and deliver medications. Throughout the operation you will be unconscious. After the surgery, you will wake up somewhat cold and slightly dizzy with possible nausea and sore throat. The feeling has been likened by some to a hangover. You will then be asked to do breathing exercises. After the operation you will likely be moved to the ICU where you will be closely monitored overnight. Length of hospital stay will vary depending upon several factors including whether there was a rupture, any complications during or after surgery and the general condition of the patient. An uncomplicated surgery generally requires a hospital stay of 4 to 6 days, with at least the first day following surgery in the Intensive Care Unit. If a rupture has occurred, a hospital stay of one to two weeks could be expected with a longer initial stay in the Intensive Care Unit to monitor for possible vasospasm. The hospital stay could be longer if complications arise. A follow-up angiogram will usually be performed before release from the hospital to confirm that the clip has completely closed off the aneurysm. After release from the hospital, the recovery period at home is three to six weeks for an uncomplicated surgery. Resumption of daily activities, such as driving a car may be as soon as one or two weeks after and uncomplicated surgery where there has been no rupture. The interval is longer where there has been a rupture and would be evaluated by your physician on an individual basis. Nausea is a reaction that some experience for a short time after general anesthesia. Medications to treat this are available, and you should consult with the anesthesiologist prior to the surgery about them. At the incision site itchiness, pain and numbness are common, as well as a clicking noise at the bone reattachment site. These are normal as the incision and the reattached bone section heal. Healing of the bone may take up to six to twelve months. Seizures or lapses in consciousness are not common, but if they do occur, medical attention should be sought immediately. Anti-convulsants are given to prevent seizures, and alcohol consumption, which contributes to the possibility of seizures, should be avoided. You must not drive a car if you are experiencing seizures, and the law requires that you surrender your driver’s license. Once the seizures are eliminated, your doctor will assist you in reclaiming it. Memory problems are a common experience and generally improve over time. Headaches are a common post-operative experience and can continue for a long time after surgery. They can be treated with medication, and you should consult your physician. After a rupture and treatment, it is highly unlikely that a re-rupture would occur, however, if an extreme or explosive headache does occur, you should seek immediate medical attention. Fatigue and tiredness are very common and can continue for six weeks or more. Dizziness, confusion, sensitivity to light, and vision or speech impairment sometimes occur. Physical, speech and occupational therapists can assist in dealing with these. Constipation sometimes occurs as a result of medications and inactivity and can be treated. Back pain from inactivity or lying still can be relieved with medication and physical therapy. Depression, fear, anxiety and anger often occur after experiencing any major surgery or medical emergency. Neurosurgery may affect the problem as well. If you are having difficulty with these feelings, it is important to get help from your physician and other medical professionals. Endovascular thrombosis or embolization or Microcoil Thrombosis (coiling) is a procedure that was introduced in 1990 as a less invasive alternative to surgical clipping. 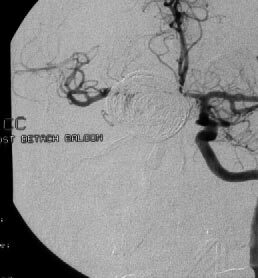 It is similar to the cerebral angiogram but instead of simply taking pictures as the contrast medium (dye) is injected into the artery, the aneurysm is treated from the catheter inside the blood vessel by the insertion of coils into the aneurysm’s sac. The coils are packed into the aneurysm. They promote blood clotting within the aneurysm. Both coils and clotting fill the aneurysm closing it off and preventing blood from entering. Balloon-assisted coiling involves a tiny balloon catheter which covers the neck or entrance to the aneurysm, holding the coils in place. Stent-assisted coiling involves a small cylindrical mesh tube which acts as a scaffolding within the aneurysm for the mass of coils. The development of supple, more flexible stents and balloons has allowed stent-assisted and balloon-assisted coiling of irregular fusiform and wide-necked aneurysms in some cases. 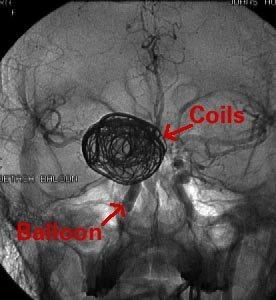 Angiogram: Many large coils in giant skull base aneurysm. Balloons have been detached below the coils to ensure the ICA interior communicating artery is closed. Coiling does not involve surgically opening the head and may be done under local or general anesthesia. Barring complications the hospital stay for the procedure is generally 1-2 days and the recovery usually takes 5-7 days (American Stroke Association). 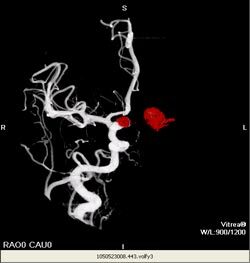 3-D reconstruction with Vitrea software, computer enhanced red coloring of coiled aneurysm. - Click image for a larger view. To view a video clip of the image, select one of the formats below. QuickTime (586 KB) - Click here to download latest QuickTime player. Coiling is performed by a neuroradiologist or endovascular surgeon. The femoral artery is accessed through a tiny incision in the groin/inner thigh where a thin hollow tube or sheath is inserted into the artery wall to allow the introduction of a catheter which is inserted and guided by a guidewire through the artery and up towards the brain. This process is guided with the use of computer-aided X-ray scanners. Once the catheter is in place, the guidewire is removed, leaving the catheter in place. A contrast dye is introduced via the catheter into the bloodstream in order to make the artery and the aneurysm clearly visible and to aid in obtaining clear radiographic images. The characteristics of the aneurysm, including shape, size and exact location, are determined and recorded. This portion of the procedure is similar to an angiogram. A microcatheter is then introduced through the larger catheter and used to deliver coils through the neck and into the sac of the aneurysm. The platinum coils are shaped like springs and are approximately twice the thickness of a human hair. There are several types of coils which vary as to shapes, pliability and levels of softness. They are attached to the end of the microcatheter. The coils placed are of progressively smaller sizes. They are individually placed and detached from the microcatheter by a small electric current. Within the microcatheter the coils are straight but, after placement in the aneurysm, they bend in a helix shape and conform to the shape of the aneurysm walls. They then form a mesh similar to steel wool. Eventually, blood cells are caught and clot on this mesh in a process called "thrombosis", effectively filling and sealing off the aneurysm from the artery circulation. Thus, as the procedure is completed, the interventional radiologist will see the aneurysm slowly darken and fade until it disappears into the surrounding brain material, effectively out of the blood circulation. There is the possibility that a coil could protrude or be dislodged from the aneurysm and reintroduced into the artery, although this is rare in experienced hands. This could cause a clot or stroke. For this reason, neuroradiologists often rule out coiling for aneurysms with a large neck-to-dome (neck-to-sac) ratio. (Johnston et al, 2000). There is also the possibility of a small aneurysm remnant occurring at the neck to the aneurysm as a result of incomplete coiling. Again, this is less likely in experienced hands. What happens to such a remnant is still being researched by the medical community. However, there is a risk that a remnant could grow or allow coils to compact over time. If there are complications or a hemorrhage event, the hospital stay could be 10-14 days or more. Angiogram: DSA disgnostic angiogram of the previous case showing a successfully coiled aneurysm. If treatment is undertaken following a rupture, it is likely that it will be done within a short time of your arrival in the hospital emergency room. It is important to have as thorough a discussion of treatment options with your doctor as your situation permits. If more time is available, as in the case where the aneurysm is discovered prior to rupture, you will have the opportunity to question the neuroradiologist or endovascular surgeon more closely about the risks and benefits of the treatment and what to expect during and after treatment. Important questions may include the frequency and success rate of the doctor and the hospital performing the procedure, potential complications, recovery time both in the hospital and at home, and the advisability of screening close family members for aneurysms. Also in the pre-operative appointment, an anesthesiologist will discuss the use of anesthesia during the procedure. General anesthesia is typically used in this procedure for patient comfort, to keep the head immobile and to assure the quality of the X-ray images. Let the doctor know ahead of time if you have a problem recovering from anesthesia. There are medications that can aid in recovery from anesthesia. Present for procedure: Interventional neurologist, fellow (in academic medical institution), Anesthesiologist (stays whole procedure) for coiling, nurses, angiotechs (responsible for assisting with equipment, redording data). - Click image for a larger view. On the day of surgery catheter will be inserted to monitor urine production. An IV (intravenous) line will be inserted in order to monitor blood and deliver medications. To gain access to your femoral artery, your groin is shaved, scrubbed and sterilized. The team decides whether to use one or both arteries based on the aneurysm characteristics and the tools necessary to treat it. Your body is then covered with sterile wraps, leaving only the groin area exposed. The anesthesiologist will administer your anesthesia. Upon completion of the procedure, you will likely be moved to the ICU (Intensive Care Unit) where you will be monitored closely for 24 to 36 hours or so. The sheath will remain in place for 24 or more hours. You will likely feel quite drowsy and may experience mild nausea from the anesthesia. You will be asked not to bend the leg with the sheath in place. The hospital stay for coiling is one to two days for an uncomplicated procedure where there has been no rupture of the aneurysm. When a rupture has occurred, the stay may be a week or longer, depending on the condition of the patient. Recovery time at home for an uncomplicated procedure may be one week or more. Daily activities may be resumed within a short time pursuant to the recommendation of your physician. Recovery at home and resumption of daily activities are generally longer after a rupture. A follow-up angiogram will be performed, usually within six to twelve months after the procedure, to confirm that the coils are in place and have eliminated the aneurysm from the blood circulation through the artery. Nausea is a reaction that some experience for a short time after general anesthesia. Medications to treat this are available, and you should consult with the anesthesiologist prior to the procedure about them. At the location in the groin where the catheter was inserted there may be slight bruising and sensitivity. Headaches, which may be accompanied by sensitivity to light, may occur and may continue for some time after treatment. They can be treated with medication, and you should consult your physician. After a rupture and treatment, it is highly unlikely that a re-rupture would occur, however, if an extreme or explosive headache does occur, you should seek immediate medical attention. Fatigue and tiredness are very common and can continue for several weeks. Depression, fear, anxiety and anger often occur after experiencing any medical procedure or medical emergency. If you are having difficulty with these feelings, it is important to get help from your physician and other medical professionals. Decisions regarding how best to treat an aneurysm patient are always specific to that particular patient and must be made on an individual case by case basis in consultation with the treating physicians. It is important to consult with and obtain the advice of both a neurosurgeon and an interventional/neuroradiologist regarding choice of treatment. The advice of a neurologist can often be helpful as well. In some cases, as with a very small aneurysm, the risks inherent in treatment outweigh the risk of rupture, and careful monitoring is the best option. In such a case a change in the size or shape of the aneurysm may warrant treatment at a later date. For very complex aneurysms arterial bypass has been used. In the U.S. surgical clipping, used since the 1960’s, has been the "gold standard" or default and the most common treatment. Coiling was first introduced in 1990. In Europe coiling has become more common than clipping, being used in approximately 75% of cases, whereas in the U.S. it is used in approximately 25% of cases. Since coiling has a shorter history of use, any potential long-term effects would not yet be confirmed. Studies have pointed to lower mortality and morbidity (neurological deficit) rates with coiling which is a less invasive procedure. 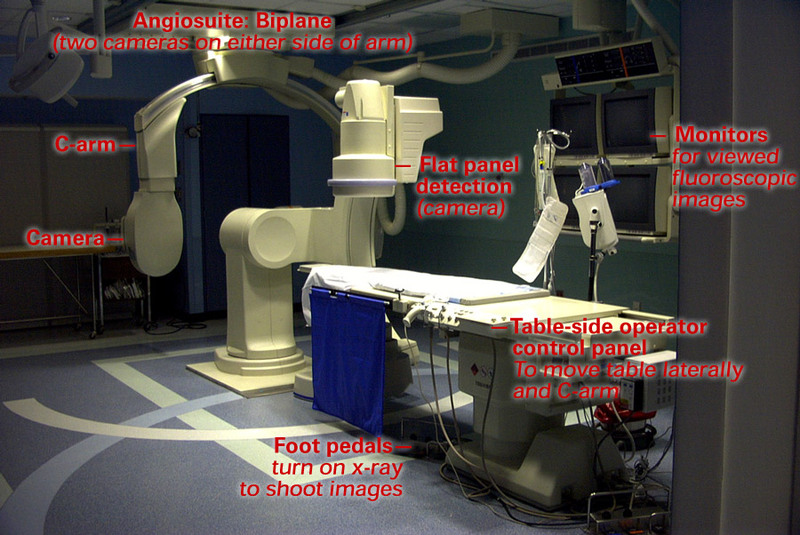 Angiogram: Note the aneurysm clip and the residual aneurysm under the clip. - Click image for a larger view. Angiogram: Coils were placed endovascularily in the residual aneurysm, and it was excluded from the circulation. This operation illustrates that many situations can require both the coiling and clipping procedures. - Click image for a larger view. Age - The older the patient, the more favorable less invasive procedures like coiling become as older patients suffer more post-surgery complications/damage. 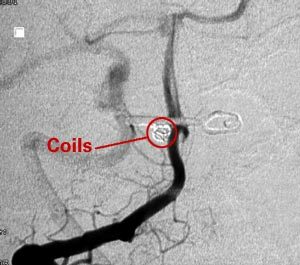 The major factors in deciding whether to use coiling are the structure and location of the aneurysm. If the sac has a wide neck where it attaches to the blood vessel, there is a danger that either a coil or some clotted blood will escape the sac, drift down the vessel and block a capillary further down the circulation system. However, the development of supple, more flexible stents and balloons has allowed stent-assisted and balloon-assisted coiling of irregular (fusiform) and wide-necked aneurysms. The ISUIA study reported a 3.8% mortality (death) and 12.0% morbidity (injury to brain function) rate for surgery on unruptured aneurysms with no prior history of SAH (Weibers et al, Lancet. 2003 Jul 12;362(9378):103-10). The rupture rate during the surgical clipping operation has been reduced with the use of temporary clipping (Levy et al. Rupture of intracranial aneurysms during endovascular coiling: management and outcomes. Neurosurgery. 2001 Oct;49(4):807-11; discussion 811-3) to approximately 2.4% according to one source (comments to Levy). In case of rupture surgery has the advantage of direct access to the blood vessels surrounding the aneurysm for control and to drain any blood. One study done on aneurysm rupture during coiling found: rupture because of microcatheter use resulted in death whereas rupture due to coil herniation outside the aneurysm dome resulted in good recovery to moderate disability (Levy et al., 2001). As with airplanes, the most dangerous time appears to be the take-off and landing, the insertion and withdrawal. This study did not conclusively point to size being a risk factor. Smaller aneurysms might be at higher risk for rupture during initial catheter placement, as the margin of error for catheter tip positioning relative to the aneurysm wall is smaller. When the wire is removed after placement of the coils, potential energy may build in the catheter’s loops and propel the tip of the catheter forward. Conversely, larger aneurysms may rupture if the catheter gets wedged between the numerous coils it deposited and the aneurysm wall. Rupture during initial coil placement is more dangerous, as there is still high blood pressure flowing into the aneurysm. Thus, most studies show ruptures towards the end of coil placement yield patients with no symptoms. Coiling has an advantage over surgery in that there are fewer alterations (brain damage) in the first and subsequent years after treatment. Ultimately, many of the factors impairing the success of a surgical clipping are the same ones that impair the success of a coiling procedure; these factors favor no intervention, if possible. The characteristics of the aneurysm, in particular location and structure, dictate which procedure should be used. Johns Hopkins University participated in the first large-scale global randomized trial of both treatments. This means that both an interventional radiologist and a neurologist consulted on each patient’s case. The cases wherein both doctors concluded that the estimated success rate of both coiling and clipping were exactly the same (either operation would have the same risk associated) were used in the randomized trial (where they alternated between clipping and coiling). Of the 250 patients treated over the course of the 3-year study, only 2 patients were included in the randomized trial. This means that in 247 cases, both the interventional radiologist and the neurosurgeon agreed that one or the other procedure was preferable with less associated risk. This demonstrates the fact that one procedure is not "better" than the other; but each one should be used in the context best suited to it. You can help yourself cope with the common problem of short-term memory loss. Ask others to slow down, simplify and relate new information they are giving you with things you remember. Repeat what others tell you a couple of times and take notes, use a planner or a notebook. Keep to a regular routine in your activities and include some word games to exercise your mind. Familial contribution: the behavioral changes and challenges associated with neurological deficits can be hard on both the aneurysm patients and their families. While providing emotional support and ensuring good health care, families can act as the eyes and ears of the patient, noticing changes of behavior and providing feedback. Your family can help you by providing emotional support, acting as your advocate with the health care system, giving you feedback on how you are doing, and helping you seek the community support you can use. The community has Support Groups which include other patients who have had similar experiences as well as experts in the health care system. You may ask your health care provider for one near you. As with the treatment of most medical conditions, the treatment of aneurysms tends to have the best outcomes in hospitals which treat higher volumes of patients with the condition. Both clipping and coiling have hospital-sensitive success rates. Thus, it is important to seek a hospital which handles higher volumes of aneurysm patients. This often includes large regional hospitals or teaching hospitals. It is also important to seek out hospitals which number among their physicians both neurosurgeons who are experienced in clipping and inverventional radiologists or neuroradiologists who are experienced in coiling. It is wise to ask the hospital how the volume of aneurysm patients it treats annually compares to the volume at other hospitals. Coil embolism is a relatively new procedure, pioneered in the 1990s. Up to then, surgical clipping had been the only method of prevention of hemorrhaging and in the U.S., although not in Europe, it is still the standard of care. It is the standard policy of many medical centers to refer an aneurysm patient only to a neurosurgeon for a surgical clipping procedure. We recommend that, in addition, you also consult with an interventional radiologist as well, to discuss coil embolism as a treatment option. Both treatment options should be considered, as time and the safety of the patient permit, and depending on the features of the aneurysm, its location and the condition of the patient. You may consult physician directories and the major medical associations for doctors who specialize in this field. As with hospitals, the more frequently a doctor performs clipping or coiling, the more successful the outcomes tend to be. Ask any doctor you are considering how often he/she performs the procedure.